Hawaii’s waterfalls are magical and diverse. Many of them are hidden treasures, off the beaten path and not visible without a hike. On Kauai, the beautiful Wailua Falls were made famous in the opening of the television series Fantasy Island, which aired from 1978 to 1984. Starring Ricardo Montalbán as Mr. Roarke and Hervé Villechaize as Tattoo, the opening of each episode would include Tattoo running up the bell tower to ring the bell and rejoice at the arrival of new guests to the mysterious Fantasy Island. “Da plane! Da plane!” Mr. Roarke would always be dressed in a white suit with dark tie, curiously awaiting the guests for each episode. The best was when Tattoo started to arrive at the bell tower in his own Tattoo-sized go-kart. Not that I ever watched it or anything. In real life these waterfalls are impressive, beautiful, everything a waterfall should be. They are located off Highway 56 to Highway 583 (Ma’alo Road). Follow it to the end of the road to the viewing area. 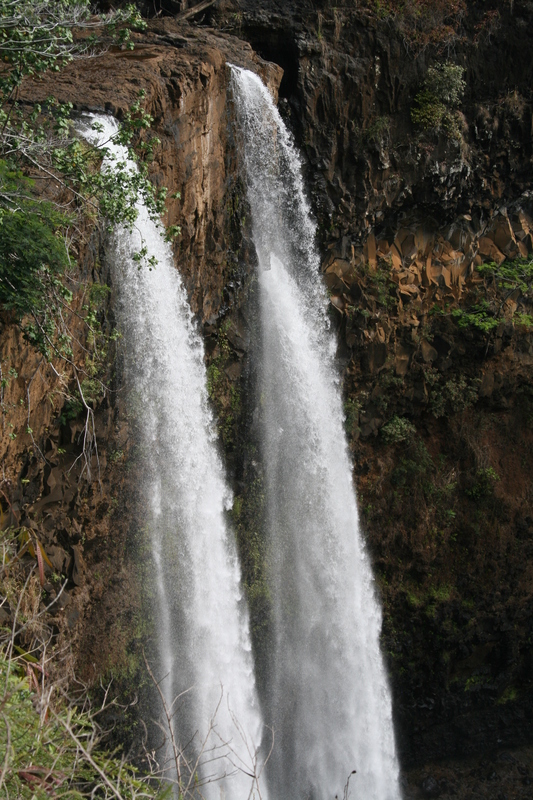 This entry was posted in Hawaii, Hawaii waterfalls, Hawaiian Islands, Kauai, Travel, United States and tagged Hawaii, Hawaii waterfalls, Hawaiian Islands, Kauai, Travel, Travel and tourism, United States by alohajournal. Bookmark the permalink.